Mumbai's famous dabbawalas are reinventing themselves to meet the challenge posed by food delivery portals. Ashok Sawant no longer swiftly pirouettes over a bouquet of aluminium lunchboxes on the back of his cycle to go to the railway station. Instead, for some weeks now, he has been hoisting loads on the broad angular body of a TVS motorcycle and driving there, the roar of the engine drowning out the jangle of tiffin carriers. 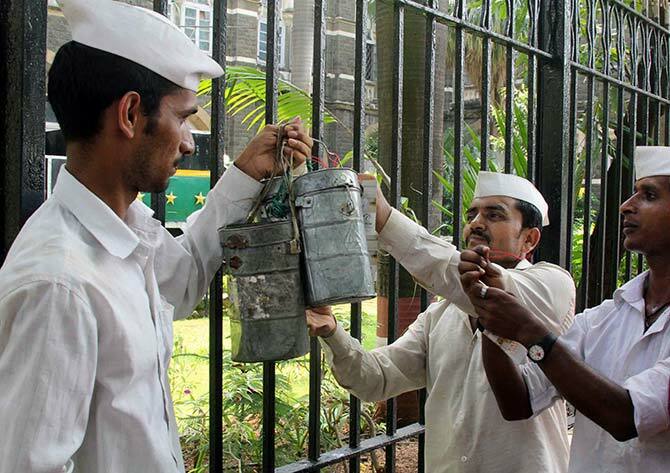 The absence of grace and romance in this does not worry the reed-like Sawant, one of Mumbai's 5,000 or so dabbawalas, known for their timely and error-free lunchbox deliveries - it's about survival, their service is under threat. Surabhi Ghosh, a 30-year-old media professional who lives alone in Mumbai, sampled various local tiffin services before she decided to order grub online or over the smartphone. The dabbawala would bring in lunch on the dot at 1 pm and was not flexible enough to match the erratic schedules of her workplace. With the food delivery apps, restaurants delivered any time - for free. 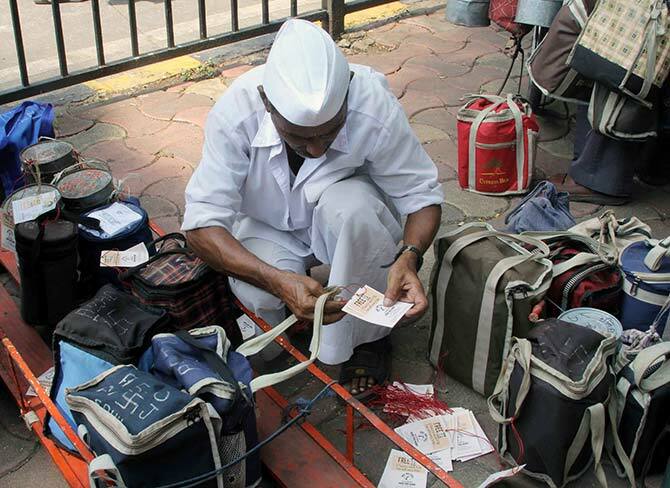 "With the dabbawala, I had to pay Rs 300 a month over and above the meals," says Ghosh. Soon, others in her office disconnected with their dabbawala. Sawant hopes the TVS will help him retain customers like Ghosh. He is part of the pilot by the Mumbai Dabbawala Association in which 100 of them will get loans to switch from cycles to bikes. With the bike, he will be able to deliver food faster and run sundry errands. "I will always prefer the cycle," says Sawant. "But we cannot stop others from doing business and we could lose out to them if we don't move with the times." Rich with money and eager to lure the young professionals, the food delivery startups offer discounts that are hard to match. The variety they offer is a bonus, which has left the dabbawala to cater to those above 40 who are careful about what they eat. "That is when people are strictly told by the doctor to stop eating outside, and stick to food packed from home," says Sawant. Gurmeet Kochhar of dabba service SpiceBox recently discontinued his association with the lunch transporters, saying routine is disturbed when they take days off for festivals and the annual puja in their village. The fact that they could not help with dinner orders and had haphazard delivery on the Central Mumbai line reinforced his decision. They work purely on monthly subscriptions and not for one-off food orders. So Samir Prasad, founder of Vegan Bites, uses dabbawalas for regular orders, while employing a logistics provider for occasional deliveries. "They tend to work like robots and sudden change in plan throws them off." The food delivery startups know there are weaknesses in the dabbawala service, which they can leverage to their advantage. "Businesses that rely on brute force will feel the pinch as more consumers use technology," says Anshul Gupta, co-founder of Box8, a meal delivery service. The dabbawalas realise this threat hangs over their heads. Earlier this year, the union launched a website to connect with the customers. A telecom plan helps all members of a team to talk to each other for free so that any error can be traced and repaired fast. And soon they will have TVS bikes. That might help as e-commerce companies have decided to utilise their skills. After tiffin deliveries, some have started to carry packages for eKart. "We are still getting used to that work. Unlike dabbas, which we leave with the security guard, these (consignments) have to reach the customer's hands," says Balu Khandbhor who handles e-commerce deliveries from Churchgate. Young dabbawala Bhushan Phapale, who recently secured an MBA degree, is working with customers like Raw Pressery, which delivers pressed juices, to bring in smartphones that can offer GPS-tracking of packages. Their work might be under threat but the dabbawalas connect with an amazing number of consumers every day, which brands realise they can use to get their products sampled. Small packs of organic fruit, sweets, digestive pills and handwash are often slipped in with the dabbas. More suggestions to help business are coming in from various quarters. The men are now toying with the idea of expanding into catering through a central kitchen to be run by their wives. They have created a reserve team to cover for those who take ill.
Their customers have suggested having some men on rotational duty instead of everybody taking vacation during festivals. The delivery service began around 1890 when a Parsi banker working in Ballard Pier enlisted a young man to ferry lunch from his home to his office. Soon, others in that office demanded such deliveries as it spared users the hassle of making lunch in the wee hours and carrying it in crowded trains, says Pawan Agrawal, who researched the dabbawalas for his PhD. Dabbawalas fulfill an estimated 200,000 deliveries each day. Ever since a 1998 Forbes article referred to its low error rate of one in 16 million deliveries, rumours about it being a Six Sigma business developed, and the modest transporters became a fixation for management gurus. 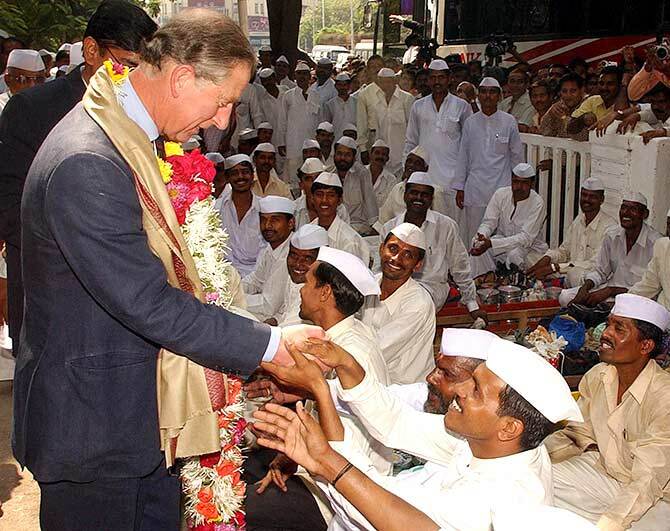 Their fame skyrocketed when Prince Charles met them in November 2003 during a tour of Mumbai. The dabbawalas originally belong to the Maval tehsil in Pune. Physically demanding feats are in their blood, they believe, as they come from a line of guerrilla soldiers trained by Shivaji. During that period, they easily scaled the hilly forts of Maharashtra, says Subhash Talekar, spokesperson for the Mumbai Dabbawala Association. "Now we use our feet to deliver lunch. Our guerrilla warfare is still studied in military schools and our dabba system is studied in management schools," he says with unalloyed pride. Agrawal defines the first three hours of their eight-hour exercise as "wartime". A typical day begins around 9 am when the dabbawala begins collecting lunchboxes from his designated neighbourhood. Each box has a code scrawled on it - a combination of alphabets, symbols and numbers - that indicates the pick-up point, drop-off point, customer and carrier. Agrawal and others in his team then leave by train and gather by 11.30 am at prime business centres like Ghatkopar, Dadar, Lower Parel, Churchgate and Andheri to divide the boxes area-wise. Soon after, he speeds off with a completely different set of boxes than the ones he arrived with and reaches them to customers in various offices before 1 pm. After 45 minutes, which he uses to have his own lunch, the dabbawala goes back to the offices to bring back empty tiffin-boxes. Next, these are sorted again and taken back to their respective homes. 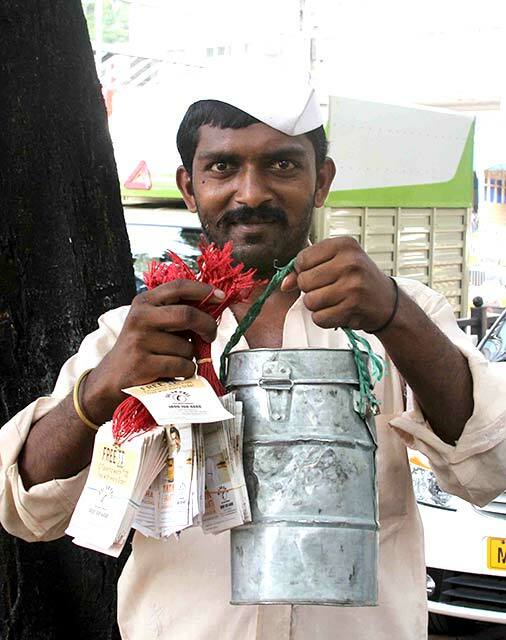 Dabbawalas are unionised and since the business is a team effort, salaries are shared. They each claim to earn Rs 10,000 to Rs 12,000 a month. Sundays, national holidays and festivals are rest days. To ensure the service remains trustworthy, new recruits are brought in only through references from existing members. They strictly dress in a white kurta-pajama and cap because it "commands respect". The dabbawala ecosystem has evolved over time. Modest aluminium carriers share space with Milton hot packs and smart pouches that hold vegan and organic meals. Besides families that send food for their school- or office-going members, the clientele comprises establishments that supply tiffin. The old-timers are happy with the service. For seven years until her daughter got married, Kokila Shah employed Janardhan, a dabbawala, who took lunch from their Ghatkopar home to the office in Lower Parel. "He never complained if I was a few minutes late or if I packed some extra food," she says. "I still see him on the cycle and he always smiles." 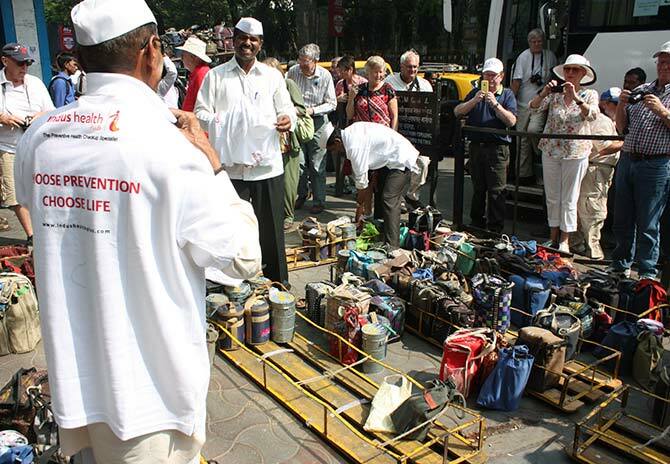 If the boxes are ever misplaced or stolen, dabbawalas search local scrap markets and recover them. Their network also supplements small ventures like that of Anagha Kolte, whose team of women workers produces 150-200 dabbas a day from two hot rooms in a Kalachowki chawl. It is cost effective and precise like clockwork, she says. The sense of familiarity and sincerity that dabbawalas offer is also what drives Jamshyd Cooper, a veterinarian who runs a small dog tiffin service, to employ them. A number of delivery startups such as Delhivery, RoadRunnr and YourGuy have entered the space but these do not inspire Cooper's faith. "I don't think they will pass the test of time. Startups either struggle with initial success or get bought over by someone and change." In the manner of modern businesses, the age-old tiffin couriers too provide add-on services like carrying spectacles or mobile phones you may have forgotten at home, or even safely transporting salaries to your home in empty tiffin boxes. The dabbawalas go about their difficult work quietly. The average Mumbaikar may not even notice them quietly disentangling bags in the corners of railway stations. Most of them accept and carry the tiffins wordlessly, maintaining a quick pace even with 25-30 lunchboxes balanced on the head. The only noise is often a loud grunt asking people to step aside. While going in to catch a train at Lower Parel, dabbawala Kiran Gavande meets others with heavy crates similarly balanced on their heads, and yet, like synchronised swimmers, they elegantly allow each other room without colliding. With nothing but a cap and a coil of cloth to provide buffer, the crates still do not swerve or teeter. As he disembarks at Churchgate, Gavande and his friends suddenly turn into celebrities. Dozens of tourists, sweaty from the heat, are waiting with cameras. The dabbawalas soon get to work and begin to shift around boxes. The more adventurous tourist wishes to hold the crates or even accompany them for deliveries. This can be annoying, Gavande confesses, unless coupled with some monetary compensation. The higher-ups are becoming aware of the power of publicity. Talekar, of the Mumbai Dabbawala Association, makes it clear the workforce has friends in high places: after Prince Charles, business tycoon Richard Branson and major actors in India have visited them. Within an hour of Prime Minister Narendra Modi asking for support to the Swachh Bharat campaign, Talekar invited television channels and got together a group of dabbawalas to clean up Lower Parel station. Many live in rented homes and lack permanent address proof but the regional transport office will help them get motorcycle licences. "We are a vote bank, after all," says Talekar. Sometimes, these men use their celebrity status to bring attention to causes like the Nepal earthquake and the killings of Narendra Dabholkar and MM Kalburgi. 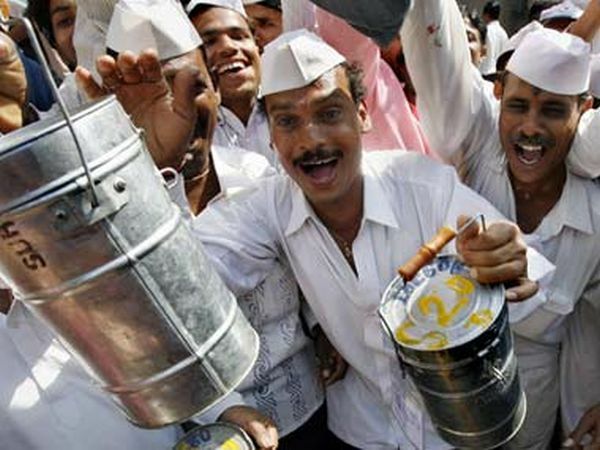 As with most enterprises, however, there are signs of dissatisfaction within the dabbawala union. In recent years, the association has been invited by colleges and organisations to give presentations about their work and has been paid for that. But the financial benefit of this does not always trickle down to everyone, according to some dabbawalas. One worry for this quick-footed force is the potential slowdown in recruitments as the next generation moves to higher education and office jobs, observes Sawant. But for now, despite anxieties about the ongoing turnaround in his century-old profession, the thought of some small pleasures brings him comfort. "With the new motorcycle, I can at least take the family out on weekends." Now, Mumbai's dabbawalas to deliver Flipkart products!